Famed as Tokyo’s most international area, Minato is beloved by both local and foreign residents. Home to countless eateries and sights, it perfectly caters to the tastes of Tokyo’s most demanding denizens. Minato is a mixed, business and residential ward located in Central Tokyo. Popular with foreign residents, the ward hosts a large number of embassies and is the headquarter location of choice for various international and domestic companies, including Honda, Sony, Apple, and Google. With over 30 train stations split across 10 different lines, Minato is a tightly packed ward comprised of dozens of unique residential and commercial districts. 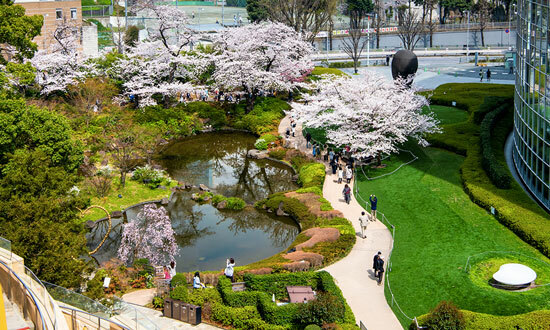 It’s impossible to list every area in this article, however, four of the most popular are Roppongi, Azabujuban, Shirokane, and Konan. Hailed as Tokyo’s nightlife capital, Roppongi is one of the trendiest and upmarket districts in Minato. Home to the head offices of a number of international companies, the area serves as an international business hub during the weekdays and an entertainment district at night. 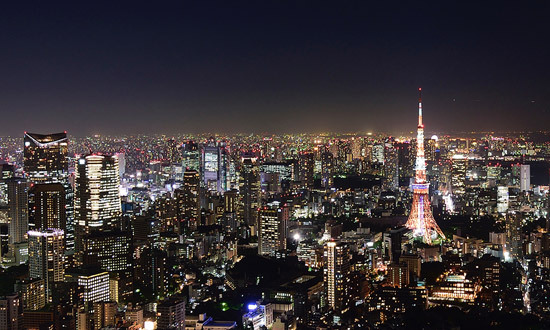 Walking the streets at night is considered unsafe by some (due to the clubbing and bar scene), however, Roppongi is often a top choice for expats who are impressed by the range of shops, fine dining, and proximity to English-speaking medical services. Azabujuban is seen by locals as the most international area of Minato, with people from various countries working at the embassies and international businesses in the district. Its local neighborhood feel meets with high-class living and cutting-edge trends to create a unique, and very liveable, atmosphere. To the south of Azabujuban lies Shirokane, its shopping streets are quieter than other parts of Minato and the general atmosphere of the area is relaxing. Also, due to the various embassies nearby, there is a strong police presence, making the area feel very safe. Konan, located in the south-east of Minato, is a particularly residential area which is popular for families. Situated by the ocean, the canals are a pleasant and safe area for walking. The price of an apartment will vary depending on its features, the age of the building, and distance from the train station. Keeping this in mind, the average rent for an apartment in Minato is approximately ¥4,244 per square meter (¥394/ft²). 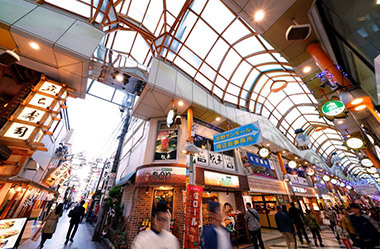 You will never find yourself bored in Minato thanks to its diverse offering of shops, eateries, and entertainment. For all you trendsetters, be sure to visit Roppongi Hills for designer clothes and sophisticated cafes and restaurants. Within one of its towers, you will also find the Mori Art Museum, a modern gallery and exhibition space regularly featuring works by both local and internationally acclaimed artists. 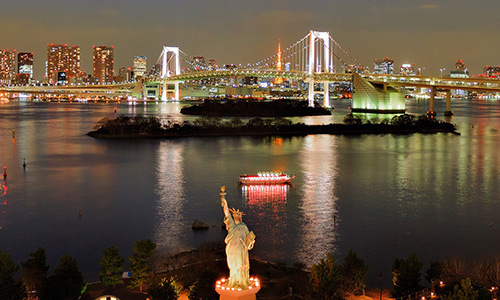 If you’re looking for the perfect night time romantic view, look no further than Odaiba. After enjoying some shopping at the Aqua City mall, take a stroll down to Odaiba Seaside Park and look across at the beautifully lit Rainbow Bridge. The replica Statue of Liberty is also a must-see! For those of you searching for a sense of community, you may be interested in joining the Tokyo American Club. The private facility located at the heart of Minato was created to meet the needs of the expat community. The club’s 3000+ members from over 50 countries have access to its cafes, restaurants, conference and party spaces, gym, bowling alley, rooftop pool, and much more. Please check their website for the membership fees and requirements. Compared to other areas of Tokyo, residents of Minato are spoiled for choice when it comes to working out. There are the usual chains such as Anytime Fitness and Gold’s Gym, as well as a number of independently owned gyms with their own special programs and trainers. Members of the Tokyo American Club can use the facility’s fitness center, however, with the high concentration of luxury apartment complexes in Minato, you may be lucky enough to have a private gym in your own building. There are many small parks scattered throughout Minato so wherever you choose to live, you’re certain to only be a short walk from one. 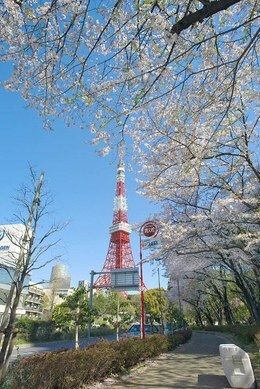 The most notable park in the area is Shiba Park with its unparalleled view of Tokyo Tower. Popular with dog walkers and runners, it’s the perfect spot for a weekend picnic or date. For those of you who really want an escape from the city, toward the south of Minato, you’ll find the Institute for Nature Study. This sprawling natural reserve has several botanical gardens, a pond, and walkways surrounded by towering trees. Due to the high concentration of embassies, international companies, and foreign residents, many English speaking clinics and services are situated in Minato. 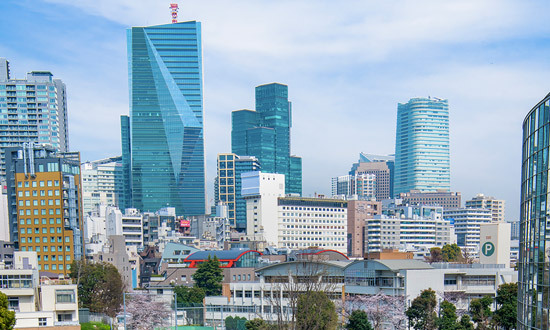 Tokyo Midtown Clinic, Roppongi Hills Clinic, and Nishiazabu International Clinic all accept Japanese health insurance and come highly recommended by expats living in the area. There are also several clinics specializing in health services for women and children. If being a short taxi ride away from English speaking doctors is important to you and your family, you may wish to consider living in or near the Minato area. Home to Tokyo’s first blow-dry bar, Minato also boasts a large number of English speaking salons with award-winning stylists trained at salons across the world, from London to New York. We have listed eight of these on our map, and new salons are opening every year. You can also visit ‘Elana Jade Organic Salon’ and ‘Nua’ for Brazilian and bikini waxing services, with few other salons offering such services in Tokyo. When it comes to international schooling, Minato simply cannot be beaten. If you are a family with young children, you will be especially pleased with the number of English speaking preschool and elementary schools. For middle and highschool aged children, there is Tokyo International School and Nishimachi International School, as well as bus routes offering easy access to schools outside of Minato. You can read our article on the Top International Schools in Tokyo for more information. Located in Minami-Azabu is National Azabu, one of Tokyo’s most beloved international supermarkets, with its extensive collection of wines, cheese, and other home comforts. National Azabu is far from the only choice when it comes to international shopping in Minato; Nissin World Delicatessen, Seijoishii (成城石井), Kaldi Coffee Farm, and several other stores are also available to provide you with that nostalgic taste of home. Want to move to Minato? Let us find your new home.